Coming up this week is one of my favorite astronomical events of the year: the Perseid meteor shower. 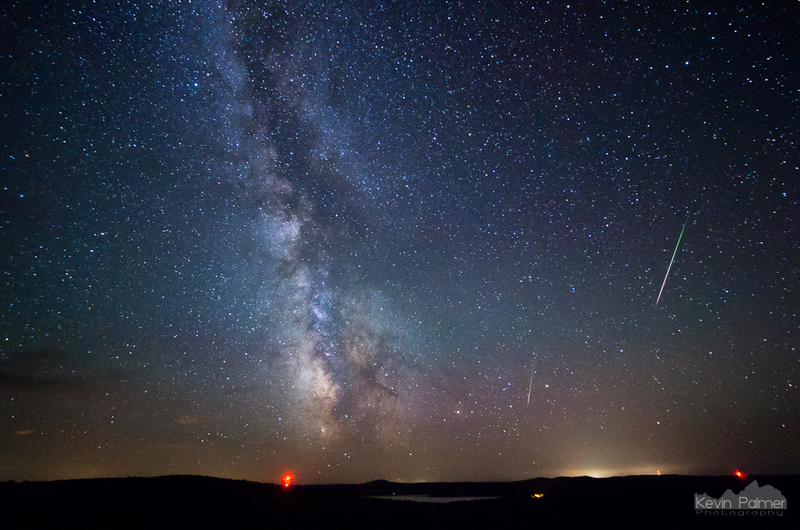 Hundreds or thousands of meteors will streak across the sky on the most active nights. 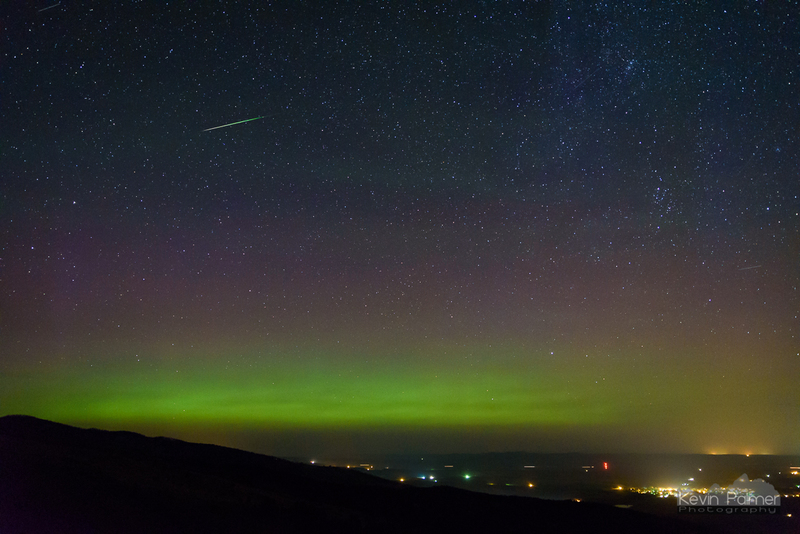 In a typical year you can expect to see about 80 meteors per hour during the peak. But this year NASA is predicting an outburst and rates could easily be double that amount. The only way to know for sure what will happen is to watch for yourself. 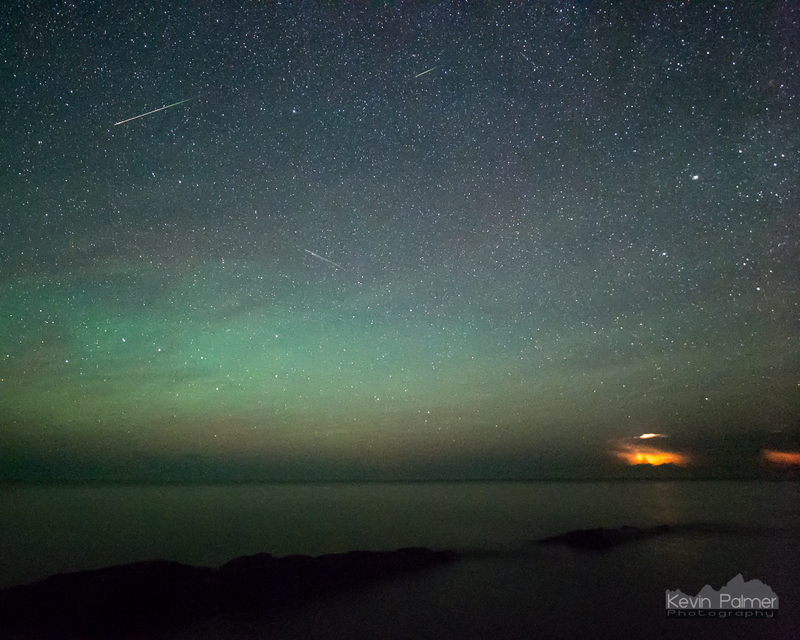 Two Perseid meteors were captured in a single 30 second exposure from Brockway Mountain, Michigan. August is one of the best months for stargazing because there is typically clear and warm weather across most of the northern hemisphere. From a city, light pollution will drown out all but the brightest meteors. So to see the most meteors, you will want to go somewhere dark. Use this map to find a dark observing location near you. I recommend a green zone or darker. Look for a place that has a clear view of the sky without too many trees. Avoid places where you may have headlights or streetlights shining in your eyes. 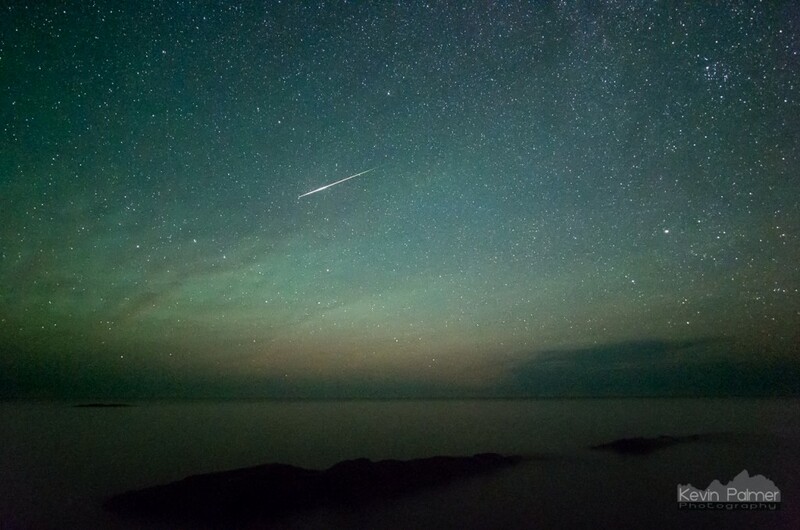 This fireball meteor left a vapor trail above Lake Superior in Michigan. The peak of the meteor shower is expected early Friday morning on August 12th. This year the waxing gibbous moon will set at about 1AM. Before that, the bright moon will hide the majority of the meteors. But with most meteor showers, they are more active in the early morning hours anyway compared to the evening. After 1AM the sky will be dark leaving around 3 good hours (depending on your latitude) for meteor watching before morning twilight kicks in. If you can’t make it out at that time (or if 1 night isn’t enough), then the mornings before and after the peak should be decent as well. The numbers won’t be as high, but there may still be surprises, like a bright fireball. Subtract about 40 minutes for the moonset if viewing on Thursday morning, and add about 40 minutes if viewing on Saturday morning. Use this website to find the exact moonset and twilight times for your location. 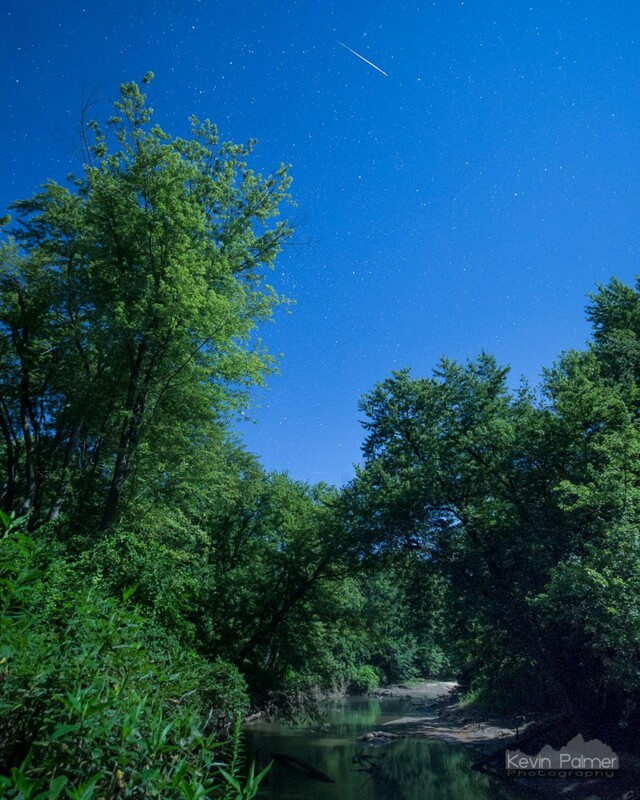 In 2014, bright moonlight made the majority of the Perseid meteors invisible above Salt Creek in Illinois. The Perseids are given their name because if you trace back their trail they seem to radiate outward from the constellation Perseus. But you don’t need to know where Perseus is to enjoy watching since meteors can appear anywhere in the sky. The numbers of meteors actually observed will usually be less than the rates predicted. That’s because astronomers use a Zenithal Hourly Rate (ZHR) which assumes perfect conditions with the radiant overhead at the zenith. To maximize the amount of meteors you’ll see you should let your eyes adapt to the darkness so you can see the dimmer stars and meteors. This can take up to 15 minutes. Flashlights, car headlights, and phone screens can ruin your night vision. Use a red flashlight if you need a light but still want to preserve your night vision. If you have a beach chair that reclines then use it so you can lean back to take in as much sky as possible. Otherwise you may want to lie on a blanket. The meteors often will come in spurts. Sometimes you will go 10 minutes without seeing one, and then you will suddenly see 3 in 10 seconds. Some of the most memorable meteors will be the fireballs or bolides. These can be extremely bright, lighting up the landscape, breaking into pieces, and often leave behind a vapor trail after they burn up. But these are random and unpredictable. You may want to to bring some coffee or an energy drink to help you stay awake. Also don’t forget to bring warm clothing since it will feel much cooler than you expect when you’re not moving very much. On 8/3/2016, an early Perseid meteor coincided with an appearance of the northern lights above Dayton, WY. This is just a very basic guide to photographing a meteor shower. A camera with manual controls that lets you set a long exposure. A DSLR works best, and shooting in raw will give you the highest image quality. A wide, and fast lens (f2.8) will give you the best chance of capturing faint meteors. A sturdy tripod is a necessity to keep the camera steady. An intervalometer will let you take pictures nonstop. This may be an external device or it could be built into your camera. Some cameras even let you connect to an intervalometer app on your phone. Don’t forget to charge your battery and clear your memory card ahead of time. Set your camera up on the tripod and find a good composition. Including something in the foreground will add interest. Also make sure the tripod is somewhere where it won’t be bumped or disturbed. Manually set your focus to infinity. This can be difficult at night depending on the lens. You may want to focus in the distance during the day and leave it there. Or you can use live view and zoom in on a bright star. Set the lens aperture to wide open (f2.8 if possible). Set the exposure time to 20-30 seconds. This will vary depending on how wide your lens is. Too long of an exposure will make the stars trail. Use a very high ISO if your camera can handle it without too much noise. If there’s much light pollution then you won’t be able to go as high. But I often shoot at ISO6400 and above. Set your intervalometer to take as many pictures as possible. If you are in an area with high humidity, monitor the camera lens for dew. 2 handwarmers strapped to the lens with a rubber band may prevent your lens from fogging over. Postprocessing: Even the best camera will still need to have noise reduction applied to the images afterwards. I use Lightroom for this, and then export all the images as JPEG’s. Then you have the option of making all the images into a time lapse video or stacking them to make startrails. The free programs VirtualDub and Starstax are great for that. Thank you for this. Exactly what I was hoping to find.